QUINIMAR is a Portuguese company founded in 1989 that manufactures and markets various high quality textile and chemical products for public works and industry. Quinimar has more than 30 years of experience in construction works at airports around the world, mainly in Europe and Central and South America. Within the wide range of Quinimar products, stand out two products of high performance destined mainly to applications of high exigency in airports: the polymers QUINIRESIN® AIRPORT and the geogrids QUINIROAD®. QUINIRESIN® AIRPORT is a high performance product for the sealing and fixing of lights and covers on airport pavements, which allows air traffic opening in just 1 HOUR. What makes it truly unique is the alliance between its excellent mechanical characteristics and its extremely fast curing, which is essential in airport works where construction work usually needs to be performed in a short space of time. QUINIROAD® geogrids are made of fiberglass and coated with oxidized bitumen for the reinforcement and retardation of cracking in airport pavements. 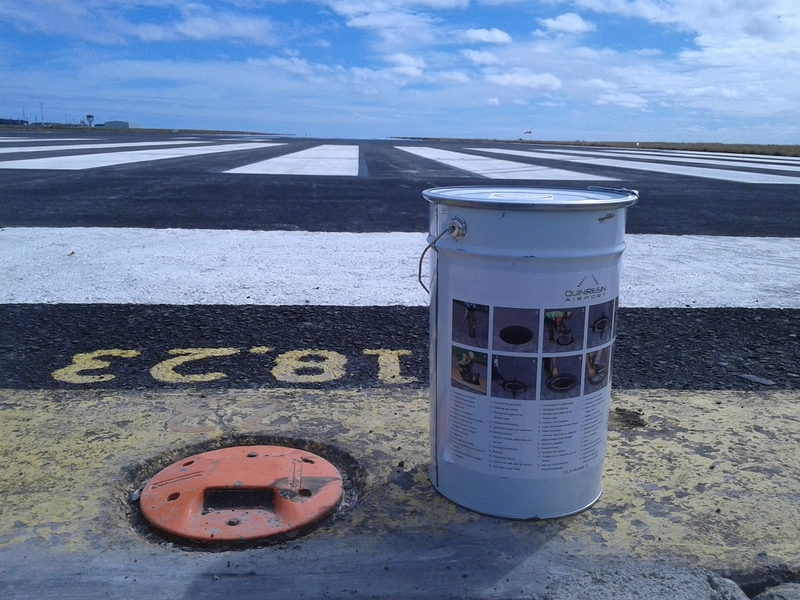 Its application is fundamental in works of rehabilitation, requalification and recharges in airport runways or taxiways.